I have had a few of you email me and ask about this yellow Wood Block Wall Art that I made for the Laundry Room in the DIY Blogger House. (Don’t know what I am talking about? You can read more about the DIY Blogger House here). 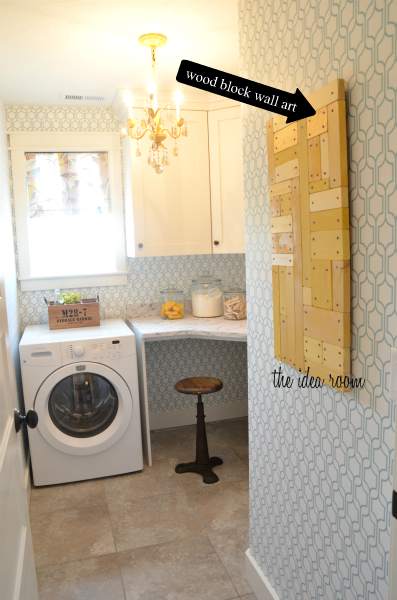 I needed to come up with an art work project that would bring a pop of color into the Laundry Room and would not compete with the fun and cheerful wall paper. (Which by the way, the wall paper we used can be found at Wayfair.com and is by York WallCoverings: Bistro 750 Trellis in the Aqua Blue/White color if any of you were interested). Anyways, I needed a simple but colorful pop of yellow in the room and spent a lot of time trying to come up with something that would fit into the space. The wallpaper was making it a bit more difficult to come up with something that would not distract or compete for your attention. I was browsing a favorite catalog one day and found the perfect piece of art. It looked simple enough and so I made some changes so that it would fit better in our small space and came up with this Wood Block Wall Art. 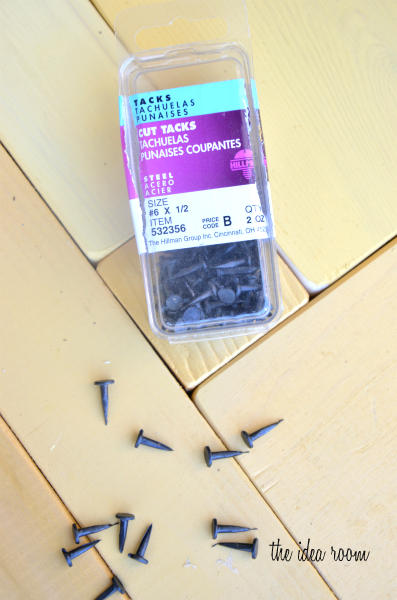 I had A LOT of scrap pieces of wood laying around from previous building projects and so the entire project cost me $1.38…the price of the carpet tacks which I show you in a later picture. The hardest part of this project was figuring out how big to make the wood pieces so that they fit together nicely. I did not have graph paper but made a grid on a piece of notebook paper. I treated each square as an 2 inches. I wanted the final art work to measure 16 x 30 inches as determined by my wall space in the Laundry Room. So I made a grid that measured 16 x 30 inches with 2 inches per square. 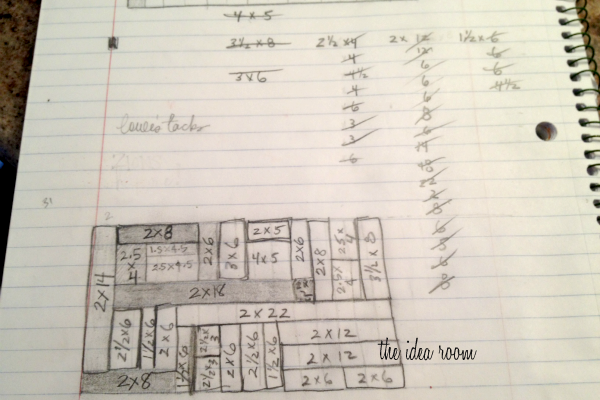 Then I just drew different sized rectangles into a random puzzle. Then I wrote the size of each wood piece so we would know what to cut out. 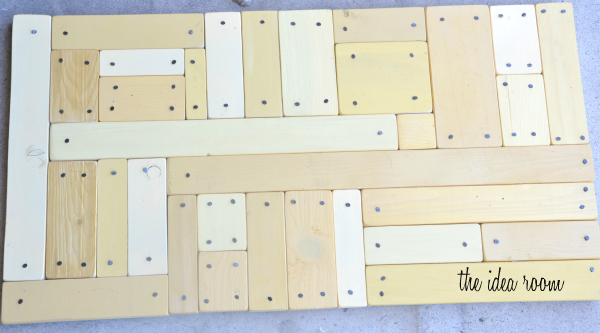 I determined the size of the wood by counting how many squares I had filled out for each piece. Then I got to work cutting out my pieces with our saw. I used my hand held sander to sand all the rough edges and round the corners of the edges slightly. Then we used the picture to lay them out back into our puzzle shape onto a thin piece of plywood that measured just a bit smaller than our original 16 x 30. The plywood will be what each piece of wood is attached too with wood glue. I took 3 different colors of yellow paint and just randomly painted the puzzle pieces. Placing each piece back into it’s proper spot very carefully separated by a little space so as not to get the pattern messed up. After the paint had dried, I used Gorilla Wood Glue on the back of every piece and let it dry. I place a few heavy boxes on top of it so that it would dry nice and tightly. Then I took these carpet tacks, which I found at Lowe’s, and just hammered them into the ends of the wood pieces. 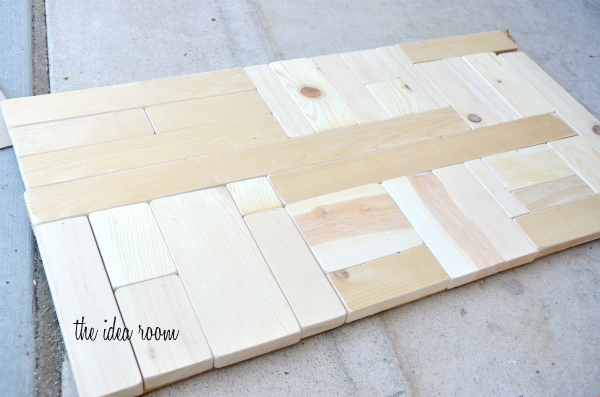 Be sure to do this carefully and away from the edges as you can split the wood easily. And that was it. 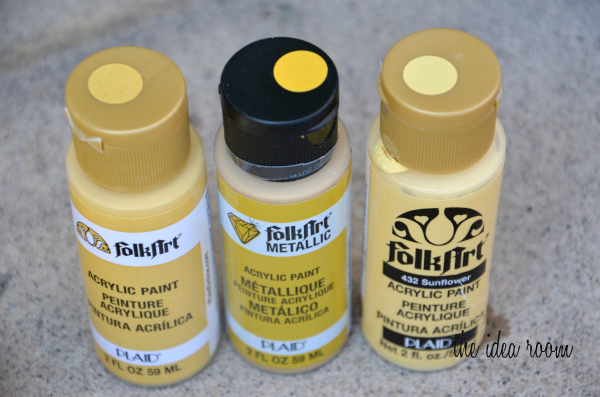 A cheap and easy project that brings some fun color and texture into your room. What do you think? I would love to see pictures if you end up making one for your home! I LOVE this project! It’s gorgeous, adds texture and color without being distracting. I think it would make a great statement piece in my bedroom. How did you hang it? My guess is that it would be pretty heavy once you get all that wood on it. Thank you for sharing this super idea!!! This project is really cool! I have not seen anything like this before. I am going to have to try it. Thanks for sharing! it kinda reminds me of dominos! it’s so cool! 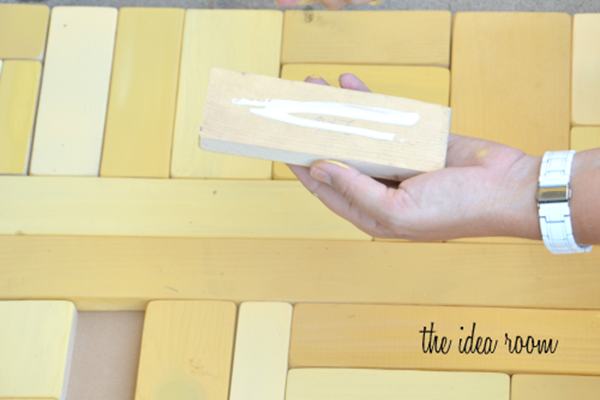 love the various paints you used as well to make some of the blocks pop! I love this idea!! Love the mind puzzle feel it has to it! Totally love this–thanks for sharing how you did it! Where did you get the yellow chandelier in the laundry room? Thanks for the comment! I think it would be fun to do some in different colors too!! I love this piece! How creative! It adds such a beautiful touch to the room without competing with that awesome wall paper. 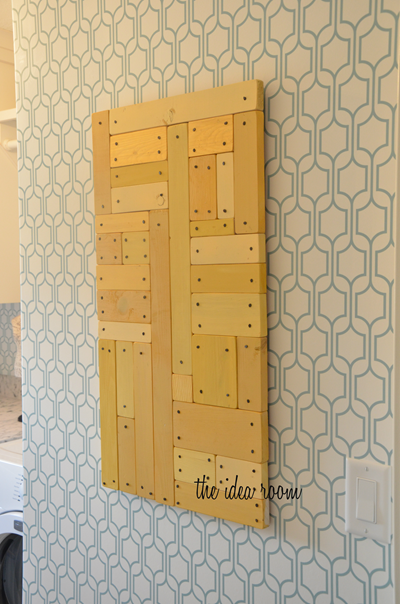 I’m a big fan of using things like scraps and reclaimed wood for home decor and this project is one of the coolest I’ve seen! Great idea! Its so creative, i guess i wont be throwing away my scrap wood next time and save it for this project!